Indian fashion stores are plentiful on Oak Tree Road and surrounding streets like Middlesex Avenue and Marconi Avenue in Edison and Iselin towns of New Jersey. These colorful Indian fashion stores on Oak Tree Road cater primarily to women, offering a range of items like Sarees, designer Anarkalis, Churidhars, Ghagra Cholis, Kurti, Indian Tunics, Lehnga, Salwar Kameez, Jodhpuri Sherwani, Indo-western Dresses, Kanjeewaram Sarees, Bridal Lehanga, Binny Silks, Chanya Choli and Dulhan attire. Besides the latest in clothing, many of the Oak Tree Road Indian fashion stores offer accessories like scarfs, bangles, necklaces and costume jewelry. Such is the popularity of Indian fashion stores in the Edison/Iselin area that they attract customers from New York, Pennsylvania, Delaware and even as far as Virginia, Maryland, North Carolina and Ontario (Canada). 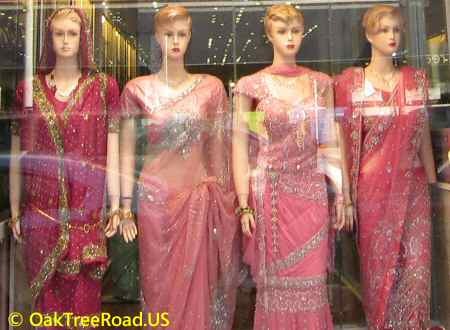 Indian weddings in New Jersey or Pennsylvania are often preceded by multiple visits to Oak Tree Road fashion stores. While the weekends are the busiest times for the Indian fashion stores, it's fairly common to see Indian women on weekdays also at these fashion stores shopping for glitzy attire for parties, weddings, Diwali, Christmas and other festive occasions.